Let's start with something we can agree on: Using a digital asset is not a new concept in finance. 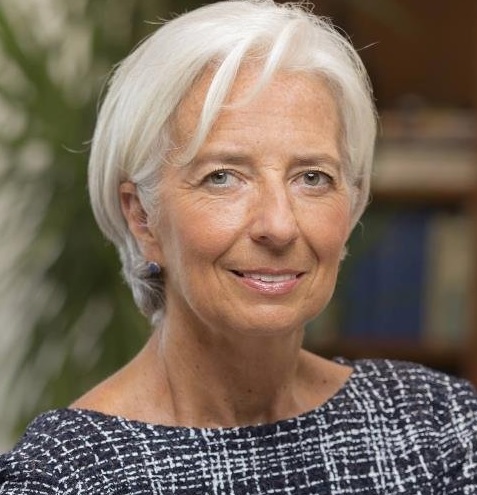 Many examples abound; derivatives, equities, even IMF Special Drawing Rights (SDRs) are all represented by electronic equivalents of their assigned value. Honestly consider how often you use a credit card instead of physical cash – all of these transactions are digital in nature, represented only by ones and zeros on a bank’s private ledger. Now consider the next logical step: Is it really that much of a stretch to accept the notion of decentralized, trust-less digital currencies? Because of statements like this from global leadership, banks are taking a close look at real-world usage of these new forms of digital value. The intricacies of how money flows through banks’ nostro accounts when transferring value across borders is a topic that can leave even seasoned members of the bank community weary; at its most basic incarnation, it involves the crediting and debiting of accounts in one country, and the debiting and crediting of accounts in a foreign bank. In addition, the technique of transferring value for a customer across borders implies that the bank must hold some of that other country’s currency in reserve for just such an occasion. All of these factors result in unused capital and additional costs for the bank. Ripple has studied these issues in depth. They are intimately familiar with international banking regulations, nostro accounts, netting systems, and the entire end-to-end process that uses outdated technology to move money from one country to another. In response, they carefully crafted a standardized approach to simplify the usage of either traditional fiat money or a digital asset, to move value easily and real-time across borders with all associated fees known in advance. Real-time payments and fee certainty are key factors; the latest banking directives from PSD2 3 and the United Kingdom’s CMA 4 specify the importance of handling faster payments, with all costs known in advance. These two points are where SWIFT’s GPI architecture falls short. Although we know that XRP can be leveraged by banks and other organizations to cut costs, using a trust-less digital asset also requires investment; part of the cost of using XRP will be acquiring or using this bridge currency. XRP simplifies the transition of value from one currency to another, but just as US dollars have historically been used in this regard, banks and other financial institutions will also need to carefully consider the terms of XRP liquidity that Ripple introduces as part of its standardized offering. Value must be transferred into and out of XRP; the high-impact factors of liquidity and volatility must be considered, along with supply and demand for this digital asset in whatever market is used to switch XRP to other currencies. Ripple has studied these factors, and has thoughtfully cultivated an active market for XRP. The cryptomarkets have reacted favorably to XRP and its use case, positioning XRP at the third spot for overall market capitalization. While this has been its historical ranking in terms of capitalization, the converted dollar amounts of volume and market capitalization have been increasing dramatically over a short time. While the latest daily volume 6 of XRP is $328 million, XRP broke its previous volume record in august of this year, with one day’s trading exceeding $2 billion. 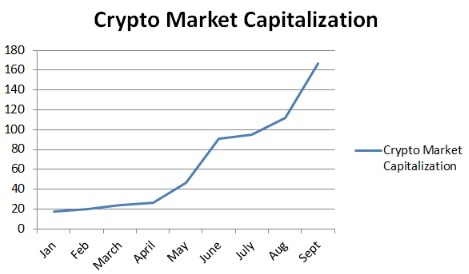 The market for XRP has seen explosive growth so far this year, and continues to grow steadily each month. In addition to being used as a bridge currency, XRP fees are used as an anti-spam measure on its network. Each transaction costs an extremely small amount of XRP; this is called a “burn rate” for the crypto-currency, and it’s why XRP is considered a deflationary asset. As XRP is used for fees, it ceases to exist; this is why the overall current amount of XRP falls just shy of 100 billion, listed at 99,993,285,883.8 This implies that approximately 6.7 million XRP has been used in fees thus far. The current minimum fee is “10 drops.”9 What is a drop? A drop is defined as one millionth of one XRP. That’s right – Ripple owns the lion’s share of XRP, while crypto investors and Ripple business partners own the other portion. This distribution has historically been one of the reasons why some crypto investors have steered clear from adding XRP to their portfolio – the fear that large holders might suddenly flood the market with XRP and reduce the market price. This notion goes against Ripple’s goal of creating an active market for XRP. Ripple needs an active market to serve as liquidity for its standardized package that uses its digital asset as a bridge currency. 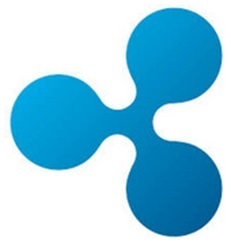 The company realized in 2017 that, despite their repeated public statements about their intention to carefully manage XRP supply, a more iron-clad approach was necessary to alleviate concerns. In February of this year, the escrow functionality of the XRP Ledger was completed.13 This feature allows a user to send conditional XRP payments. One of these conditions can be a specified date: Once that date arrives, the XRP then becomes available.14 This function has other capabilities, but the date-based crypto-condition is one that many different financial companies and banks can use for various purposes. And Ripple realized it could serve another purpose as well. 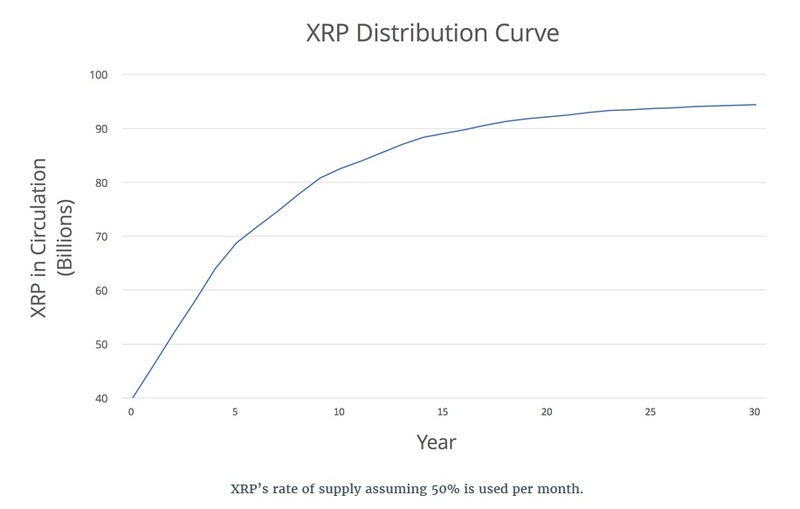 This XRP supply chart allows fund managers and traders to calculate with certainty what the supply side of the XRP equation looks like; This plan also provides Ripple the flexibility to strategically invest XRP in market development. This trend is regarded as a steady but aggressively growing demand for trust-less, decentralized assets in general, and also XRP in specific, because of its potential to transform worldwide cross-border value transfer. XRP Investors like me have been enthusiastically investing in the digital asset for some time, in anticipation of its use as a worldwide bridge currency. Since 2012, Ripple has methodically added software tools to its portfolio of offerings, carefully laying the foundation for the usage of XRP to lower costs. Ripple’s first standardized software product suite is known as xCurrent. xCurrent supports the usage of Ripple’s messaging software and the Interledger Protocol for linking banks’ private ledgers to other banks and financial institutions, along with messaging functionality.18 xCurrent doesn’t require banks to use XRP; banks are able to use Ripple’s xCurrent for any currency they choose. While xRapid’s adoption is just beginning, it marks a milestone not only for Ripple and XRP, but also for the use of trust-less digital assets in general; it signals mainstream adoption of blockchain technology for value transfer, allowing the world to see what the future holds. Ripple planned the SWELL conference to happen during the same time as SIBOS, in an effort to elevate the topic of blockchain technology to a more central role in international thought leadership. Blockchain technology is no longer a novelty or experiment; after years of waiting, the world is ready for a change in the speed and cost of international value transfer. The SWELL conference affords Ripple the opportunity to educate banks about how their offerings will fit within existing technology architecture. One thing to keep in mind about Ripple; they are keenly aware of banks’ propensity for risk avoidance, balanced with the need to bring international payments infrastructure into the modern era. The opportunity to present this technology on a world stage has been a long time in the making, but it’s finally here. If you’re a crypto investor, it’s easy to focus solely on what makes XRP so revolutionary; its ability to facilitate the transition of value from one fiat currency to another; but it’s also wise to remember that as a simple “store of value,” its performance metrics far outclass anything else in the crypto space; Bitcoin takes more than an hour to settle a payment, and the transaction costs are very high. Ethereum requires fifteen blocks to settle, usually requiring upwards of two minutes’ time. To anybody who’s transferred Bitcoin from one exchange to another and had to wait an hour before being able to trade, XRP is head-and-shoulders better. When time is of the essence for a crypto trader, XRP is the best alternative for real-time transfer and trading. Banking finds itself on the cusp of a transformational technology that leverages the strength and advantages of trust-less, decentralized digital assets. In Toronto next week, industry leaders will meet with both legacy technology representatives from SWIFT, and the next generation of financial technology at SWELL. Each interaction and meeting will occur in the midst of a historically significant turning point for the way in which financial information flows across borders. The eyes of those in the cryptomarket will be watching as well. Our fellow crypto investors will be examining the daily news from SWELL closely for indications of market trends and sentiment, with some hoping to make short-term profits; others will be measuring the potential of a unique opportunity for a long-term investment. XRP is the leader among its peers in speed, scalability, and as a secure store of value. Its market has shown explosive growth in volume and liquidity - all prior to Ripple creating the escrow lock-up of XRP supply. Unlike some competing crypto investment choices, XRP’s value is based on solid use cases that describe a technology poised to transform international commerce.